commissioner from 1999 to 2007. “The idea was first mooted in 2013 when it became obvious that the presidential candidate would come from the north,” a senior member of APC told said. He, however, said “there has been no movement since then”. But it is gathered that the idea has been revived and, in fact, Osibajo has quietly started preparing in anticipation of the likelihood of his candidature. With the APC tagged by its opponents as the Nigerian equivalent of Egypt’s Muslim Brotherhood, Osibajo’s candidature is expected to give significant mileage to the party in the Christian community. The professor of law is a pastor in the Redeemed Christian Church of God ─ one of the largest churches in Nigeria. 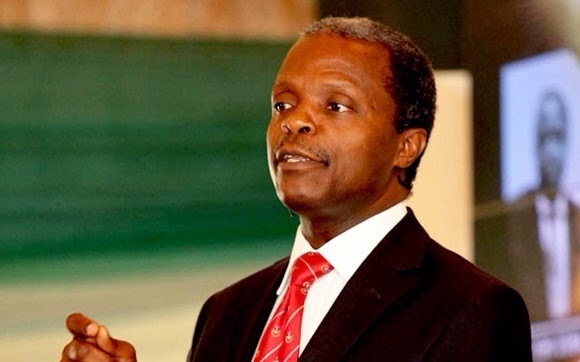 Osibajo, who holds a bachelor of law from the University of Lagos and a master’s from the London School of Economics, is highly regarded as an upright man and is a regular speaker at local and international conferences. The senior advocate of Nigeria (SAN) co-founded Integrity, the umbrella organisation of the Convention on Business Integrity in Nigeria. He is a scholar and has authored and co-authored several publications, notably The Unification and Reform of The Nigerian Criminal Law and Procedure Codes; Law Development and Administrator; The Anotated Civil Procedure rules of The Supreme Courts in Nigeria and Cross Examination: A Trial Lawyer’s Most Potent Weapon. Osibajo recently wrote to defend accusations of religious bigotry against Osun Governor Rauf Aregbesola ahead of the governorship election in the state. In an article seen as a veiled foray into the political debate ahead of the 2015 elections, he wrote: “How can we fail to see that the incredible corruption, incompetence, poverty of 2/3 of our people after almost seven years of the present government is unsupportable? How is it that Diezani’s use of 10billion Naira to run her private jet (the same amount of money for the building of 24 mega schools in Osun!) and the complete silence of the President on this travesty does not lead to calling for him to be voted out in 2015? So the allegation of the missing or unaccounted for 20.8 billion USD with 110 million desperately poor, should be dismissed as pure propaganda?” He took a swipe at the ruling party, writing: “So it doesn’t make a difference to us that under the PDP Nigeria has fallen behind in every human development indicator? 55,000 women dying yearly of maternal related ailments, only recently Stanford’s Professor Larry Diamond compared the deaths of over 300,000 children yearly in Nigeria to the killing of 800,000 mainly Tutsis in Rwanda. The latter was described as genocide, what is the description to give to mass deaths of infants caused by grand corruption?” The leading presidential aspirants in APC are Major-Gen. Muhammadu Buhari (rtd), former Vice-President Atiku Abubakar, Governor Rabiu Musa Kwankwaso and Dr. Bukola Saraki. Speaker of the house of representatives, Hon. Aminu Waziri Tambuwal, is also expected to defect to APC and declare his interest in the presidential race.